you’re made for eachother. custom is made for both of you. The process for full custom and light custom is similar, both include personalized design attention and direction, but the light custom process doesn’t include the concept phase with design board creation. All light custom orders begin with a consultation, either by phone or in person at our Walnut Creek or Sacramento design studios. This is when we discuss your overall wedding aesthetic and talk through specific must haves for your package. We also like to learn the particulars for your invitation suite, day of paper goods and any other paper materials needed for your celebration so we can prepare an estimate specific to you, this includes the cards needed and a rough quantity estimate. After we have a more defined sense of your design preferences and style, we move on to proofing. For each suite we start with three original proofs, integrating different elements from our consultation to create three distinct looks for your invitation suite. Proofs are designed to scale and include any frills we discussed, like ribbon, custom postage or wax seals. Any embellishment shown on our frills page HERE falls into the light custom category. We are also happy to source custom colors for embellishments to better tailor your suite to your wedding design. Once a final proof is approved, we will send along an itemized invoice and a payment link. Production begins as soon as payment has been received. This is the exciting part where ideas and paper dreams become real. Our production time varies for every order, based on the complexity of the suite. Our team will always estimate a completion date after proofing, but this will vary by couple. All custom orders begin with a consultation, either by phone or in person at our Walnut Creek or Sacramento design studios. We are also happy to travel to your location (additional fee applies). This is when we discuss your overall wedding aesthetic and talk through specific must haves for your package. We also like to establish a budget for your invitation suite, day of paper goods and any other paper materials needed for your celebration to help guide the concept phase of our process. The concept step is when we take what we discussed with you during your consultation and create a custom style board for your wedding branding package. The concept board isn’t a proof, it’s where we compile inspiration images of materials, techniques, embellishments and stylistic elements, creating a visual direction for your paper design. After a concept board is approved, we move on to proofing. 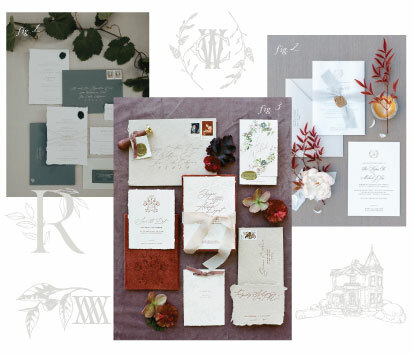 For each suite we start with three original proofs, integrating different elements from the concept board to create three distinct looks for your invitation suite. 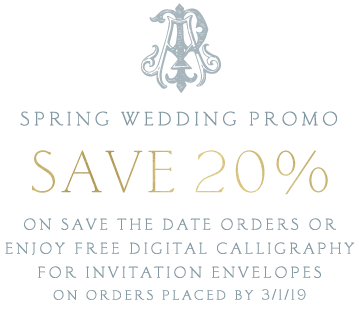 Proofs include sourced materials, such as ribbons, mailing boxes, laser cut embellishments, etc., as well as specific card designs. Once a final proof is approved, we will send along an itemized invoice and a payment link. Production begins as soon as payment has been received. This is the exciting part where ideas and paper dreams become real. Our production time varies for every order, based on the complexity of the suite, and the materials used. Our team will always estimate a completion date after proofing, but this will vary by couple. click below to view a few of our favorite suites from past couples. click below to visit our inquiry form and get in touch for a consultation and estimate. Aerialist originally grew from my love of paper and obsession with letterpress after a brief foray into printing for elective credits in college. We started our company a few years later while I was in law school, but design quickly took over as my passion project while law became more of a hobby. After graduating (over 7 years ago! ), working with couples and their planners to tell their love stories through paper became my full-time dream job. I like to think of myself as a versatile designer. I have certain styles I naturally gravitate to but my first love is the pull of creating something totally original and special for our couples. I thrive on design challenges and I love sourcing just the right elements to create a paper experience for our couples and their guests. A little more about me...Favorite House Design: Woodrow · Favorite Color: Dove gray, stone gray, storm gray, moon gray, basically, all the grays · Favorite Book: Love in the Time of Cholera · Favorite Store: Anthropologie · Favorite Movie: Pride and Prejudice (the Keira Knightley version!) · Favorite Magazine: Conde Nast Traveler· Caffeinated Drink of Choice: a whole milk latte from Equator Coffee · Next Place I Want to Visit: Prague · Can't Live Without: my Kindle · Favorite font: Rare Bird Specimen 1 · Lucky Number: 9 · Dream Job When I Was Little: President · Something Random About Me: I’ve known my husband and business partner, Craig, since kindergarten! · On Saturday, you can usually find me: Snuggling my lab-pei, Lucy, and reading on the couch in pajamas.